Preview Saturday 14 April from 1pm; Artist’s Talk and Q & A hosted by Tim Parkin 2-3pm (book your tickets here). Little did I imagine on reading (and re-reading) my copy of “First Light” in the ‘noughties’ that the time would come when I was invited to show my own images at the gallery bearing Joe Cornish’s name. I was fortunate to meeting someone in 2013 (thank you Andrea) who suggested I get in touch with curator Jo Rose. I nearly didn’t – I wasn’t sure that my abstracts of water and light from the Peak District would be ‘right’ – but after a phone chat I travelled up to show Jo my prints and returned with an offer of a solo exhibition which became “Moments of Confluence: A River’s Song” in 2015. I’ve now been invited back for a second ‘solo’ to show a new collection of images under the title “Of Wood and Water”. This prompts me to consider how my photography was both inspired by ‘First Light’, and has changed since. And how the images of water that were exhibited in June 2015 continue to inform what I do and have led to “Of Wood and Water”. We are often inspired to reproduce the images that we see and this is a natural starting point for us all. However creativity is about the process as much as any product – the ideas sparked, the train of thought, the exploration and, yes, the failures – so while replication may help you learn the craft, it is unlikely to help you develop personally. When we moved to the Peak District in 2007 rather than have to travel in search of a ‘fix’ on days off or wait for holidays, I could simply walk from the door which gave me the opportunity to get to know an area really well, and to keep going back. For the first 4 years I did the fairly obvious things – climbed the hills, tried to compress wide views into photo format, found the smaller landscapes within and enjoyed the exclusivity of the ends of the day and, when it came, the golden hour. I was very happy doing this. By early 2011 I had developed some unexpected constraints of my own – fatigue plagued me, and so I went out less often, with less gear, and the hills and dawns were left behind. But in summer 2012 I found something in a mundane corner that intrigued me and I will be forever grateful that this happened. My image making changed dramatically when I paused by my local river, the Dove. The few images that I made that day were unremarkable but were enough to draw me back and I began to experiment with shutter speed. I quickly settled on using a square format and isolating – abstracting – the water from the land. It became addictive. I little knew where it would lead. Once you stop, once you scratch a little and get under the surface, you realise that there are so many more possibilities than you could have imagined. Photography can sometimes seem to give us too many choices, and by removing some of these we have to be more resourceful to find a satisfactory solution. Creative skills require practice. Even small areas are seldom exhausted – only our imagination. Returning to an area helps us get beyond the obvious and find our own personal landscapes. Since showing this first collection of work at the Joe Cornish Galleries in 2015 I have continued my dialogue with the Dove, exploring its many faces and moods. Inevitably the trees along the river bank, reflected in the water, are a part of the images and of my experimentation. The changes that the river has brought about in my photography have carried over into my exploration of woodland and my interrogation of individual trees on land, and late last year I decided to draw these together for a new portfolio book. These personal interpretations of wood and water, made over the past 3 years, form the basis for the images selected for display at The Joe Cornish Galleries. They reflect not only the seasons as experienced near my home in the Peak District and during visits to North Yorkshire, but the curiosity that water has inspired in my practice. Water has fundamentally changed my way of seeing and my camera is now simply a tool that lends itself to creative interpretations. I rarely make ‘static’ images these days – if my subject matter is not moving, I will move myself or use other techniques to deconstruct the literal and reimagine the subjective. The changes in my photography – from record to interpretation and impression – now also extend to the way in which I process my image files and I’m looking forward to developing further a new series of abstracts that take me closer still to the water and light that started it all. “Of Wood and Water: Photographs by Michela Griffith” opens on Saturday 14 April with a preview starting at 1pm. There will be an artist’s talk and question and answer session hosted by Tim Parkin between 2pm and 3pm. Tickets for the talk and Q&A are available from the gallery. The exhibition continues until Tuesday 22 May and is at the Joe Cornish Galleries, Register House, Zetland Street, Northallerton North Yorkshire, DL6 1NA. 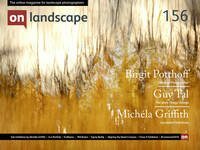 The Gallery has a number of events planned for Saturday 14 July: as well as Michela’s exhibition launch, the gallery courtyard will re-open for 2018 with an outdoor exhibition by photographer Tessa Bunney of cut flower images printed on Chromaluxe panels for outdoor display. The images are from “FarmerFlorist”, an ongoing project about the local ‘artisan’ cut flower farms which have recently sprung up in the UK. You can also see Michela’s images in print on display within the Peak District during Derbyshire Open Arts 25 May to 3 June and at the Great Dome Art Fair in Buxton 13 to 15 July (further details here).